The Advance Winter Loop finally came to fruition today — two weeks after the original date planned. I was doubtful Saturday morning, when I saw the snow on the ground and more falling. This morning, though, it was sunny and by noon it was over 40 degrees. The southern part of the county didn’t get that much snow anyway. 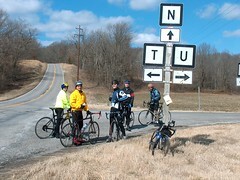 As you can see from the photo of the gang at NUT junction, it was a beautiful day. We had a great ride all around. People who skipped this ride must be regretting it now. The ride was a total of 54 miles. We started at Dutchtown, rode out A to Whitewater, then on to U. Took U south to NUT junction, where we continued south on T. This got into the hilliest part of the ride; there are a couple of short but very steep stretches in there, and some beautiful views from the ridge. Cody made the top of the hills first, despite a sore knee.Â Collin would have been right in there, but he broke his chain trying to make a big sprint. Coming down off the ridge, we met up with 91, which we took into Advance. From there we took O east to P, and P north through Perkins to Delta. In Delta we picked up N to the west a few miles, then turned north to Allenville on county roads, and from there north to A. Then we retraced our path a couple of miles on A back to Dutchtown. This entry was posted on Sunday, February 18th, 2007 at 9:49 pm	and is filed under Bicycling, Missouriana. You can follow any responses to this entry through the RSS 2.0 feed. You can leave a response, or trackback from your own site. Envy! Someone borrowed my helmet a couple of weeks ago and I won’t be getting it back for a couple more weeks. Yesterday’s bout of 65 degree sunshine prompted me to get another helmet — and hey, since I have a bike here and a bike in Berkeley I should have a helmet in each place too, right? — so I can start riding again. The weather is now rotating among snow, sleet, rain, and hail.